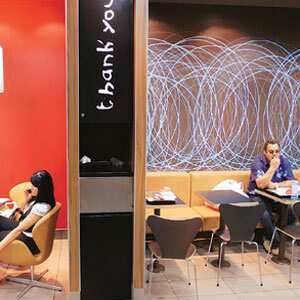 Makeover: Customers at a newly-designed McDonald’s in London. Taking a respite from an afternoon of shopping, Ita Clift sips a cappuccino at a McDonald’s. Though she rarely sets foot in the fast-food restaurant, Clift says she dropped in to this one in the Edgware Road section of Northwest London for a quick boost of energy, and because the restaurant “looked so nice and sophisticated". The changes are more than cosmetic. McDonald’s is introducing healthier foods and items that cater to regional tastes, like caffe latte. Hoping to attract young adults and professionals, in addition to its core customer base of children, the chain is also adding amenities such as Internet access and rental iPods. The changes are paying off. In the first half of this year, combined sales at Europe’s 6,400 outlets rose 15%, to $4.1 billion (Rs16,800 crore), compared with a 6% increase in the US. “McDonald’s is doing a great job in Europe, which has become an important market for them," said Larry Miller, an analyst at RBC Capital Markets. The chain now serves more than 10 million customers a day in Europe, which contributes 36% to the firm’s operating income. The original impetus for the makeover was a European sales slump in the late 1990s, brought on by concerns about obesity and annoyance at unappealing decor and grumpy employees. But the ideas for how to change came from Denis Hennequin, president of McDonald’s Europe, the first non-American in that role. As head of McDonald’s in France in the late 1990s, Hennequin had searched for ways to make fast food appealing to a nation that prefers slow-simmered cassoulets and likes to savour a meal. “To make a Big Mac work, we had to pay more attention to showcasing," says Hennequin. But now, the success of his makeovers comes with a challenge of its own: How much can you upgrade before McDonald’s isn’t McDonald’s anymore? “If you stretch the brand too much, it can snap," said Dean Crutchfield, director, marketing, Wolff Olins, brand consultants in New York. Hennequin said he did not have a choice. “Reimaging is essential in the competitive world of retail," he said. “We need to avoid aging faster than our customers."